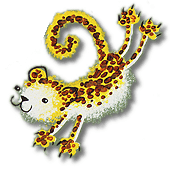 So here I am – just one little link in a blog chain of fabulous authors and author/illustrators called The Awfully Big Blog Adventure and we are all talking about The Next Big Thing ie. What we’re working on now! And so what’s happening with me? 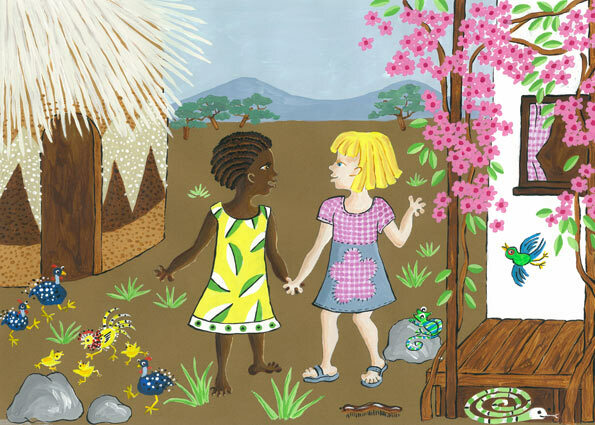 Mimi, a native African girl teaches her friend, Miranda, a white girl and outsider, how to make paint from plants, rocks, fruits and other things and they paint EVERYTHING! What will Miranda’s parents say? What will happen when the rains come? A celebration of natural creativity and African colour. This idea came from a true story from my childhood. I was taught by my friend, a native African girl how to make paint and how to paint simply, confidently and boldly onto the dry earth and tree trunks and rocks and walls with a true African palette. I still paint like this now. Cultural diversity, but also picture books for young children and slightly older as it is a fun, bright picture book with a twist at the end. Do you know – I just don’t know any 8 year old child actors? Any suggestions folks? I am currently looking for an agent – my previous books were published by Boxer Books – this title will be with another publisher. Hardly any time at all – however the text has been revised possibly four times – and of course will benefit from editing. I find the illustrations easier and I think they are looking good so far. If Mimi and Miranda could be as good as the Handa books, that would be brilliant! That’s easy – my childhood friendship with an African girl. Well I must say that with all my books, the art comes first – then the lyrical writing. So I am hopeful that every spread will be a feast for the eyes – that’s how I have approached my previous books. However, I have had loads of interest from librarians and teachers and booksellers for this title and perhaps that simply comes from the cultural diversity appeal of the story as well as the art. So now I tag my next author(s)/illustrator(s) who will continue blogging on the theme of THE NEXT BIG THING and pass them into your care! I am once again opening my garden and studio for the Wokingham Arts Trail on September 15th & 16th. Visit the Arts Trail website for more information. COMING SOON! 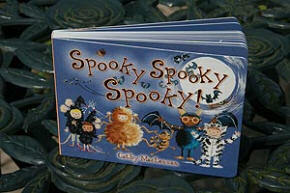 A lovely little board book edition of 'Spooky Spooky Spooky'. 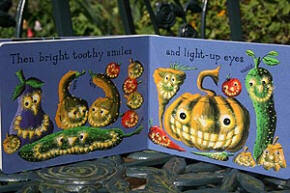 Published September 4th 2012 by Boxer Books. 'Bunny Bunny Catkin' has been shortlisted in the Book Illustration category of the V&A Illustration Awards 2012. The awards, established in 1972, have previously been won by Quentin Blake amongst others. For more information read the full press release.